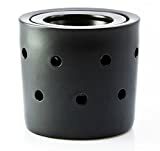 A solid, weighty Oil Burner made from stoneware ceramic and finished in matt black. Includes ceramic base/body, ceramic oil bowl, ceramic tealight candle cup & 1 tealight candle. Measures 13cm high, 13.5cm wide. Packaged in black box. Karmakamet first opened its door in the year 2001 as a small shop in Bangkok; Jajujak Weekend Market selling first grade essential oils. Not so long after, because of our product quality, Karmakamet were well known as the trademark of best quality aromatic products in Thailand. We did not stop there, we now concentrate on developing our products to exceed your expectations as we would like to become you personal scentologist.